We're out of the water again. 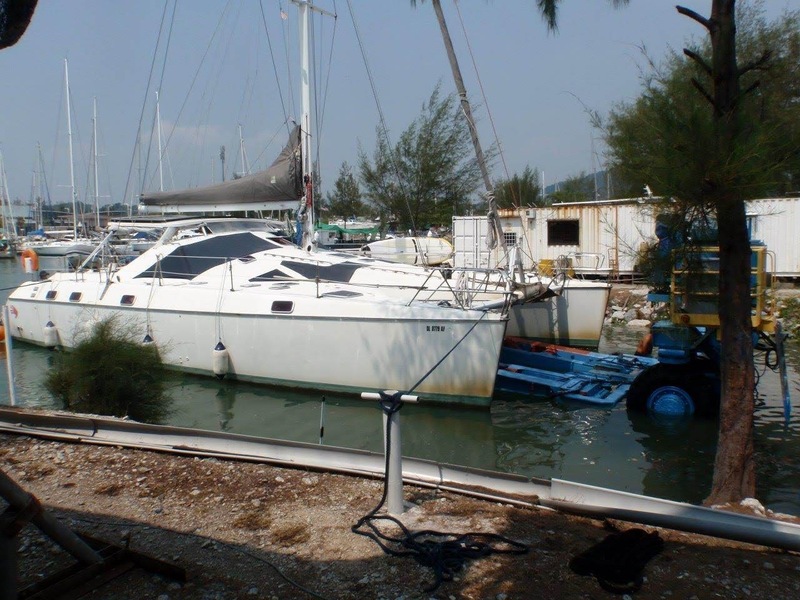 This time it's at Pangkor Marina and Boatyard in Malaysia and the reason is a wobbly rudder and some planned land travel to India and Nepal. The Sea-Lift machine used to lift us out of the water is similar to the Roodberg machine that raised us in Darwin, but different. This time around, we tried our darnedest to keep the floors from buckling while we were in the air, as they did in Darwin. Our problem is we have escape hatches that get in the way of placing the lifting arms along the strongest part of the bottom. 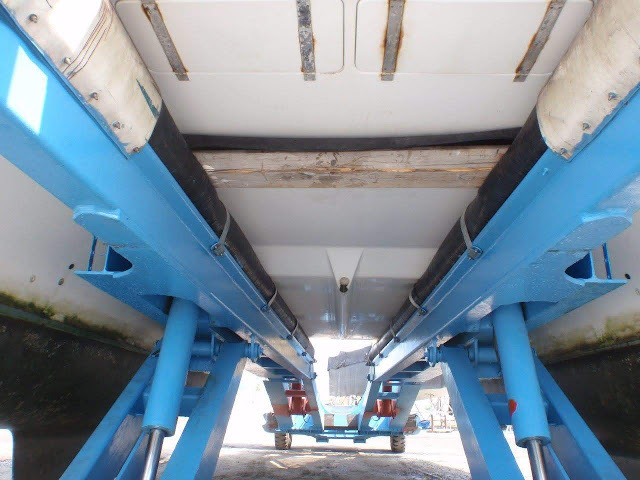 It's a bit of a trick to place the lifting arms while the boat is in the water. In Darwin, Perry actually rested on the bottom as the tide went out (which wasn't great for our nerves when the boat banged a wee bit on the concrete ramp). Here at Marina Island, we were tied to four spots on shore. This held us mostly steady. Mr. Beh is the veteran Sea-Lift operator that has been running the machine since it arrived at the marina almost 10 years ago. He was sensitive to our hand-wringing. He let some air out of the inflatable tubes that cover the arms, to reduce pressure on the escape hatches. He and his team were very careful about placement of the wooden support beam that was used to spread the weight across the structural parts of the boat. It took Matt, Mr. Beh and a couple other guys in the water to get everything lined up. It didn't help that one of the pieces of timber (about 10 feet long) being used was made of some sort of heavy hardwood that was difficult to maneuver. After all that, when we finally got lifted, we still had some floorboard buckling (this is the thin flooring that covers the structural fiberglass in the main cabin). Although the noise and flexing were disconcerting (Mark especially was very worried), everything was okay. As it turns out, it is a good thing we dropped the rudders (although there was only play in one, we wanted to check the other as well). The starboard rudder bearing had become unglued and even though the repair will be simple, it's definitely needed. As we disassembled everything to get at the rudder bearing, we also discovered that the rudder quadrant had a crack that requires a weld and the rudder post has a small pinhole that needs to be filled to prevent corrosion. Annoying to add to the list of repairs, but better we are finding all this out now, rather than in the middle of the ocean. Although the rudder bearing was the main reason for our haul-out, being in a boatyard always seems to lengthen the To Do list. Things are relatively cheap here in Malaysia, which might move up the timeline for some jobs. So far, we are very happy with Pangkor Marina. The staff is helpful and friendly (and they genuinely seem to enjoy themselves). It may be the Happiest Marina on Earth.